Tonight, well after dark, the big brown truck delivered the 2nd Merlin loco works engine to my railway. A Maestro 0-6-0 that is a mix of Merlin and Beck technology and the first RC model from the Merlin range that had remote direction control. He will be named Scatha, after another of the great dragons of middle earth. Now I will be looking for a Merlin Monarch or other engine in thier range in GWR green. The plan right now is for 4 live steamers, all from Merlin. This one will be kept dry when not in use as it is a brass boiler model. 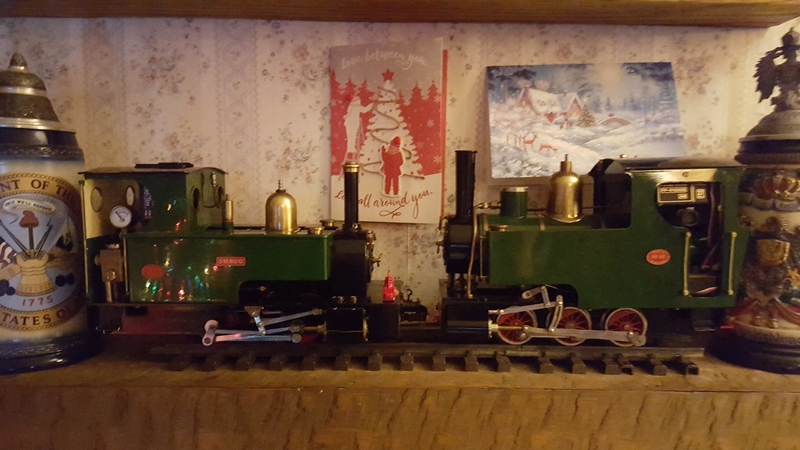 Came from the collection of Marc Horovitz, editor of Garden Railways magazine and has little to no run time according to Marc. Will try steaming up on Christmas eve, our family gathering is tomorrow and I will be to tired from all the socializing when we get home. Merry Christmas everybody!! !